A kid's spider costume can be fun and easy to make. Whether you love the denizens of Sunny Patch or are just enchanted with dressing as a wriggly eight-legged crawly critter, there are a lot of fun Miss Spider and other spider family Halloween costumes available for little arachnid-loving kids. A spider costume can also be easy and fun for parents and kids to make together and then you'll be a family stepping out in unique style. Miss Spider. The costume is a fleece jumpsuit in distinctive black and yellow with an attached plush headpiece, leaving faces free to yell "trick or treat" and breathe easy. Dangly legs are attached to the back. Bounce. 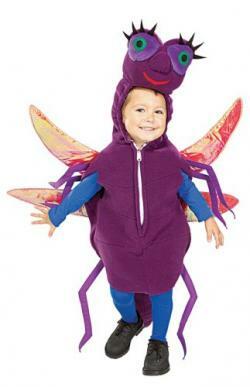 Miss Spider's pal's costume is a romper-style blue critter with wiggle antennas and a metallic sheen. Dragon. A purple and lavender fleece jumpsuit with an attached plush headpiece and big buggy eyes. Dragon has dangly legs and pretty attached wings and a tail. The tail might be a little awkward for sitting. Squirt. Little Squirt's green and lavender costume is a fleece jumpsuit with an attached plush headpiece and dangly legs. Miss Spider. This Miss is a plump yellow spider with purple legs and arms and eight purple dangly legs. Above her plush headpiece is a little pink hat. Sizes are 2-4T. Miss Spider Shimmer. This is a fleece jumpsuit in teal and magenta with a plush headpiece, green antenna, and mustard-yellow wings attached. Sizes are 2-4T. They also have Dragon, Squirt and Bounce, all looking far more like the beloved characters, but priced accordingly. However, the costumes often come up secondhand on eBay and Craig's List, so keep an eye out for them. Kids don't have to be into Miss Spider to want to be wiggly Miss Muffett frighteners. Even babies, who are probably mostly interested in eating spiders, can also get into the fun. You can get an adorable baby spider costume for your crawler at Celebrate Express. It's black with purple trim and is a pullover spider web vest with eight legs and a fun hat. One size fits up to 24M. You and your kids can be a whole family of spiders and have fun making the costumes, too. Since scissors and some sewing are usually involved, close supervision is a must. All you need for a homemade spider costume are a black top and leggings or tights. Then take two pairs of old black tights or hose, cut them to your ideal dimensions, fill them with either polyfill stuffing from a fabric shop or just old rags, and stitch them to the back of the top. To make them bend and stand out, stuff them with plastic-coated wire or pipe cleaners before your final stitching. To be extra ghoulish, fit out everyone in some fangs and a bit of black makeup. If you're wanting to make a costume that's a bit more elaborate, patterns for spider costumes can be found in any fabric shop, or even for free online at sites like Sewing Freebies. Wriggle away!